This versatile stock can be used for most Korean soups and stews. And the beef can be shredded or cut and used in soups, sauces, sandwiches, and even as banchan on its own. If you want to eat it as banchan, just mix it with a splash of tamari, dark sesame oil, toasted sesame seeds, chopped green onion, pinch of salt, and a generous amount of freshly ground black pepper. Enjoy! In a large bowl or pot, submerge the brisket in water and soak for 20-30 minutes. Drain. Add 12-15 cups of filtered water, brisket from step 1, and rest of the ingredients to a large pot. Heat over moderately-high heat and bring to a boil. Once the contents reach a rolling boil, uncover the pot completely, lower the heat to medium, and continue boiling for 15-20 minutes. Remove the anchovies and dashima using a slotted spoon or fat skimmer. Lower the heat, cover the pot, and allow the contents to simmer until the meat becomes soft (at least 1 – 1 1/2 hr). Test for doneness by sticking a metal chopstick or skewer through the meat. When done, there should be no resistance. Once soft, remove the brisket from stock and allow to sit for a few minutes. Shred or cut as desired. The meat can be enjoyed in soups, sauces, or on its own. The stock can now be used for most recipes that calls for stock or broth. Alternatively, you can completely cool the stock in the refrigerator and skim off any floating fat before using. You can place the dried anchovies in a large tea bag before placing them in the pot for easy removal later on. Dashima (or kombu) and dried anchovies for soup are readily available at Korean grocery stores. Dried anchovies for soups are about the size of your pinky finger. If you are not near a Korean grocer, Amazon.com should also carry these items. Thank you MJ! Brisket stock is pretty common in Korean cooking. 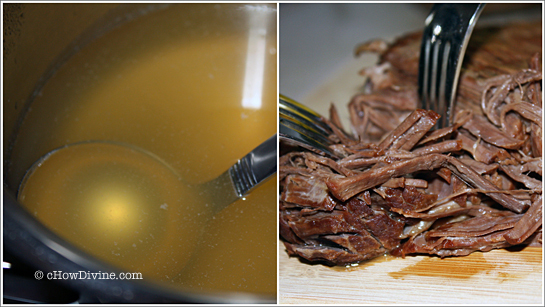 This is my favorite way to make beef stock. It’s what my palate craves and what I grew up with. You’re right as always 😉 The secret is in the dried anchovies! The best! Love both options adding anchovies and kelp…the flavor is so much deeper and that much more richer! YUM! Thanks Sandra! They do make most stock or broth so much better. That’s probably why most Korean cooks I know can’t make do with store-bought broth!